Japan is a fascinating country occupied with diverse landscapes, unique culture, ancient architecture and so much more. Whether you’re looking to explore historic sights, immerse in cultural experiences, encounter unforgettable wildlife or you simply want to bask into spectacular vistas of luscious gardens, bustling cityscapes and serene islands, this 12 day self-guided tour offers a unique, peaceful and enthralling adventure for every type of traveller (DA). Upon arrival at Narita Airport, you will meet an assistant in the arrivals lobby who will transfer you to your hotel in Tokyo. After check-in, spend the rest of the day is at leisure to explore this vibrant city. Enjoy an 8 hour day tour of this fascinating city with a local guide. Beginning with a visit to the popular Meiji Shrine, followed by a walk down the lovely Omotesando shopping street, lined with multiple flagship retail stores and broad trees. 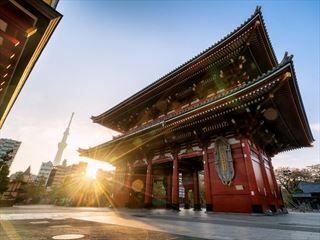 You’ll then head over to Asakusa, Tokyo’s old town, where you’ll explore Tokyo’s oldest temple and wander down the market street to try some local snacks. Your tour will end with a cup of steaming matcha and Japanese sweets as you relax in a tea house set in the beautiful Hamarikyu Garden. Journey to the Eastern part of Tokyo, the Fukagawa district. You’ll enjoy a scenic guided stroll through the gorgeous Kiyosumi Teien Gardens which date back to 1721, which leads up to the fascinating Fukagawa Fudo-do Temple. Visiting this particular temple is a very solemn and unique experience, featuring the goma-kito ceremony in which you will be able to observe from close by as you watch the chief Buddhist priest’s chants and sutras whilst other priests play the Taiko drums. Ride the local train with a guide to Omiya to visit the Bonsai Museum, the world’s first publicly-run museum devoted to traditional botanical art. The museum harmoniously blends with its surrounding environment, displaying an extensive collection of these majestic little trees with a beautiful garden. You will learn about how the bonsai masters grow their living masterpieces, and the painstaking care and attention to detail they apply to ensure they are perfect. Please Note: You must specify if you would like to do one of these tours at the time of booking, and you may only choose one of the tours. Make your way to Tokyo station to board the famous bullet train. Reaching speeds of up to 186mph, you will arrive in Izu Peninsula, in the Shizuoka Prefecture in around one and a half hours. Once you arrive at your hotel, the rest of the day can be spent at your leisure in this relaxed seaside region. This morning, you’ll head back to the station to catch a train to Kyoto, taking just under 4 hours. Once you arrive in the afternoon, an assistant will meet you at the hotel for your scheduled experience today: a traditional tea ceremony with a professional instructor. You will learn about all the types of tea, how to prepare it with special instruments, see how every movement in the process has a meaning, and the importance of serving tea to guests in Japan. This should take around two and a half hours. Today will be spent exploring the former imperial capital with an interesting local guide, visiting some of Kyoto’s World Heritage Sites. Your tour will start with a visit to the Golden Pavilion, one of the city’s most famous temples. You’ll then move on to Nijo Castle, which features an ornamental design and flourishing garden views. Take a walk down the narrow Nishiki Market, lined by more than a hundred shops and restaurants, and take a look around Kyoto’s Kitchen to find unique food related products as well as Kyoto specialities. 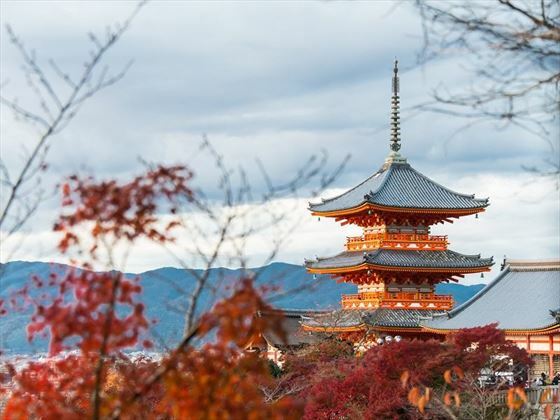 You can decide how you would like to end the day; with 1,400 temples in Kyoto alone, we suggest exploring Kiyomizu or Sanjusangendo, two very unique temples which offer spectacular views of the city. You have the choice of one of the following tours today; please let us know at the time of booking which tour you would prefer. Transfer from your hotel to Nara (45 mins) with a local guide. Today, you’ll be visiting some of the many ancient temples and shrines in the city - Todaiji temple and Kasuga Taisha Shrine. At the end of the day, you’ll head to Nara Park for an unforgettable encounter with over 1,000 tame wild deer living there. You will be picked up from your hotel and taken to the home of a professional instructor, specialising in a traditional art form of your choice. Options include – Japanese calligraphy, Ikebana flower arrangement, Origami and Japanese traditional dance. This morning, you will make your way to Kyoto station and catch the Shinkansen to Okayama, which will take around an hour. After checking in at the hotel, you’ll catch another train to Kurashiki which will take under 15 minutes. You’ll take a self-guided visit to the Kurashiki Bikan Area, known for its retro-modern cityscapes. Wander through the narrow stone-paved streets and discover a selection of galleries, coffee shops and souvenir shops along the way. If you’re interested in art, you may consider a visit to the well-known Ohara Museum, which holds the oldest private collection of Western art and offers a unique, calming atmosphere. 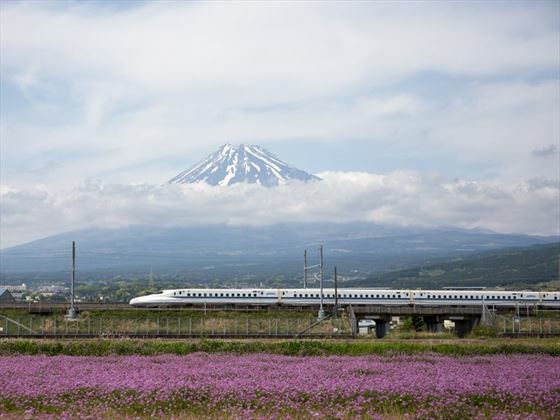 After enjoying breakfast at your hotel, you will board the Shinkansen bullet train from Okayama Station to Hiroshima. 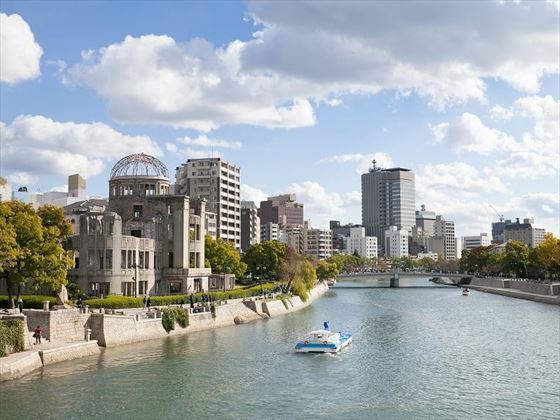 Upon check-in at your hotel in Hiroshima, you will have the rest of the day to explore this scenic city. 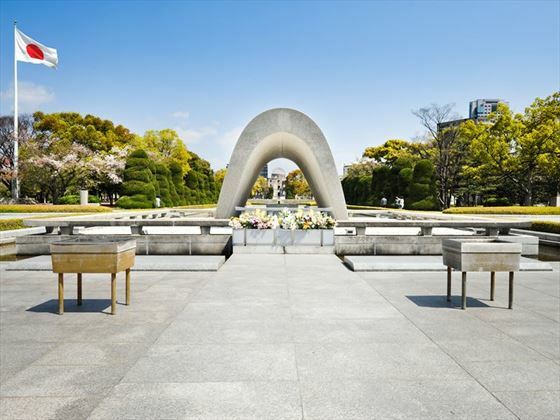 You will meet with your guide at the hotel, and your first visit today will be the Peace Memorial Park. The area where this park now lies was ground zero for the infamous Atomic Bomb in 1945. After this tragedy, the memorial park was created and dedicated to those who lost their lives in the attack. You will walk through the park to find many touching monuments and memorials, before heading into the museum. From Hiroshima, a short ferry journey will take you to the holy Miyajima Island. 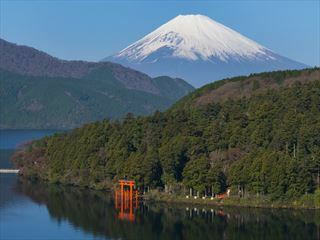 Here, you will find the famous Floating Torii Gate, a UNESCO World Heritage Site. You’ll have some free time to explore the island’s many shrines and temples before heading back to your hotel. Make your own way to Hiroshima Station for your ride aboard the Shinkansen to either Tokyo or Osaka. Alighting at your specified destination, make your way to your hotel. You are free to spend the rest of the day at your leisure. Your day is free until your scheduled transfer to the airport (Narita – Tokyo, Kansai – Osaka) for your return flight. 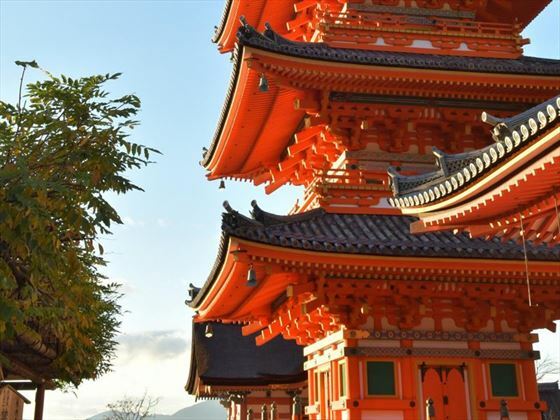 A superb eight-night escorted tour of Japan encompassing the wonders of Tokyo, iconic Mount Fuji, and beautiful UNESCO World Heritage Sites. With a maximum of 26 guests and many meals included, this is the perfect way to experience this fascinating country. 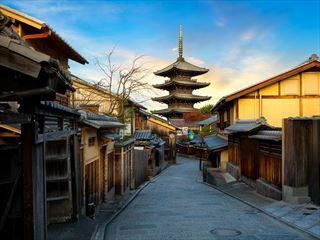 Delve into Japan's diverse cultural, historical and naturally beautiful lifestyle on this fantastic eight-night tour. 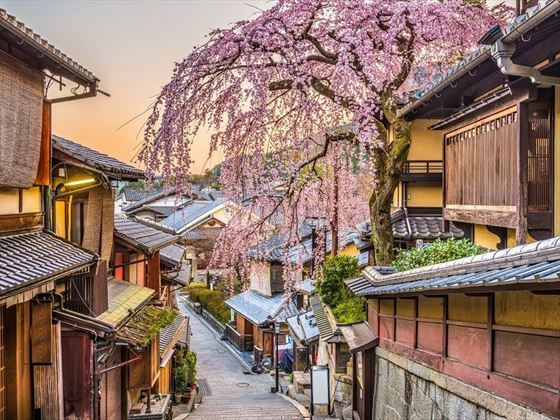 Starting in Osaka and ending in Tokyo, you'll spend your time experiencing this country's undeniable charm, including visiting the Ninja Museum, dining at a local monastery, and discovering important shrines. Japan is a land where ancient culture and modern life blend to create a truly timeless and exciting experience for anyone who visits. 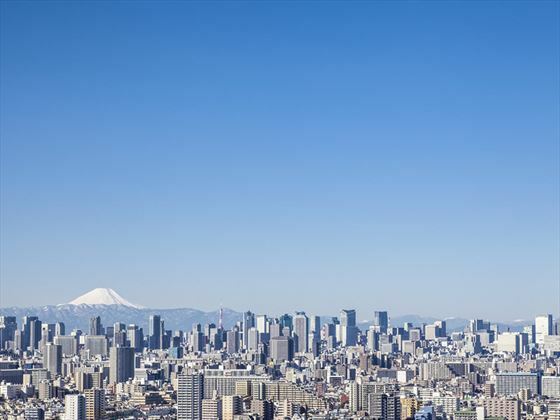 During this 14-day self-guided tour, you will be exploring some of Japan’s most historically and culturally significant locations, starting and ending in Tokyo. You'll discover five remarkable and completely unique cities, numerous UNESCO Sites and some of the most beautiful landscapes to exist, including Mt Fuji.